Before the rise of synchronized sound in the late 1920s, movie theater owners tried all kinds of different ways to get words and music into the movie-going experience. They brought in enormous orchestras, they built gigantic sound effects machines, and they even tried putting voice actors behind the screen who would read lines for the people who appeared in the movie, doing their best to sync up with their lips. Needless to say, many of these early efforts failed. When it came to recorded sound, movie pioneers were confronted with a number of different issues, including the simple problem of volume. Above we see one theater owner's solution from 1918: the Automatic Electric Orchestra. 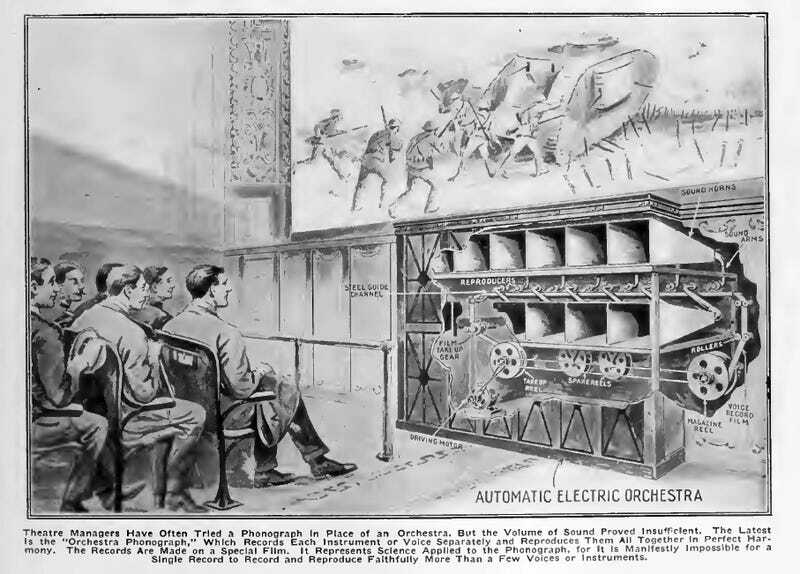 Under the headline "New Orchestra Phonograph Plays 48 Records At Once," the illustration shows a World War I-era movie theater that was trying to play recorded music for patrons as they watched a battle film. It's hard to tell much about the device from the thin article, but it proposed that a reel of film each have a different individual recording of an instrument and that they would all be played at once. While we reproduce with a wonderful perfection a single voice or a single instrument with the gramophone, the effect obtained never equals the original when it comes to reproducing an orchestra of musicians or a chorus of singers. This new system, developed by an electrical engineer in New York named Mr. H. Hartman was supposed to fix all that. Essentially they were trying to apply the analog principles for recorded sound onto a new filmstrip medium where each instrument played independently but in sync. Recorded sound was very much in its infancy during WWI and playing a song loudly for a roomful of people was difficult. There's no way this primitive device worked very well (especially when it came to syncing with the images), but it was certainly an ingenious idea that predated the sync-sound filmstrips that would eventually replace it.